Macquarie scientists are part of a promising international research project which has developed a better way to treat the fatal brain tumour Glioblastoma multiforme with chemotherapy drugs, using nanoparticles to both trick the Blood Brain Barrier into admitting the drugs, and to get the drugs to target the tumour at its source. 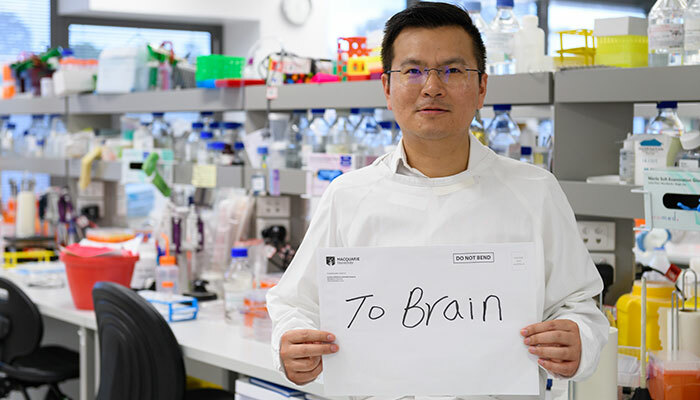 The brain postman: Dr Binyang Shi's nickname springs from the fact that he can help delvier drugs into the brain that get past the blood-brain-barrier. Dr Shi, who is an NHMRC-ARC Dementia Research Development Fellow from Macquarie’s Department of Biomedical Sciences, together with Macquarie Research Fellow, Anne (Yan) Zou, led an international consortium of scientists at Henan University, Nankai University and Sichuan University for the project. The result is a new multifunctional medicine that overcomes two of the most difficult challenges in brain tumour treatment – something Dr Shi calls his ‘one stone, two birds’ technique. “We’ve developed a brain-drug delivery system that lets us deliver drugs across the natural blood-brain barrier (the first ‘bird’), but importantly also allows direct tumour targeting (the second ‘bird’),” explains Dr Shi. “This a world-first, and we’ve shown it to be very effective as we can slow the progression of these brain tumours by a factor of five, in animal trials,” explains Dr Shi. The team also collaborated with the head of Neurosurgery at Henan Province Hospital, China to treat two serious brain tumour patients with approved ethics. Dr Shi says it’s too early to report on the results of this treatment. Glioblastoma is the most common form of adult brain cancer - and has a devastating prognosis. Only one in five people diagnosed with brain cancer will survive for five years or more; and around 1300 people die in Australia each year from this and other brain cancers. For glioblastoma, which spreads into surrounding brain tissue with finger-like tentacles, surgery to remove the tumour is rarely successful, so research has focused on drug treatments. There are several chemotherapy drugs approved for use and which have been shown to attack brain tumours in the laboratory, such as Temozolomide (TMZ) – but they don’t work well in clinical trials, Dr Shi says. Breakthrough: Dr Shi's brain tumour drug delivery system targets tumours themselves rather than having the drugs 'floating around getting into other tissues'. Glioblastoma fatality rates have barely shifted, because the drugs that can attack the tumour faces a ‘therapeutic bottleneck’ on two levels. The first bottleneck is that the protective blood-brain barrier (which saves our brains from many infections) blocks most of the drug molecules from passing into the brain which dramatically limits their effectiveness. The second bottleneck is the way these drugs work; they don’t have a ‘targeting’ capability, says Dr Shi, meaning that they don’t lodge in particular tissues in the body, so they will spread throughout the central nervous system, and they can have very toxic side effects; doses high enough to wipe out the tumour will likely also kill the patient. “We needed to find a way to get the drugs through the blood-brain barrier, and then to target the tumour rather than have them floating around and getting into other tissues,” he explains. Dr Shi’s bio-nanoparticle (bio-NP) brain delivery system involves an outer membrane that hides the chemotherapy drugs so they can pass the blood-brain barrier without losing their potency. The system is also engineered so that it will lodge in brain tumour tissue, and then release the drugs once it has invaded the tumour cell, killing the cancerous tissue. “Brain tumours are complex, difficult diseases to treat,” says Dr Shi. A single drug isn’t usually effective against brain tumours, and Dr Shi’s system allows a medication to be formulated that combines different drugs – such as chemical, siRNA and protein-based drugs - making up a combinational therapy that can attack the cancer. “This is our other ongoing research project,” he explains. 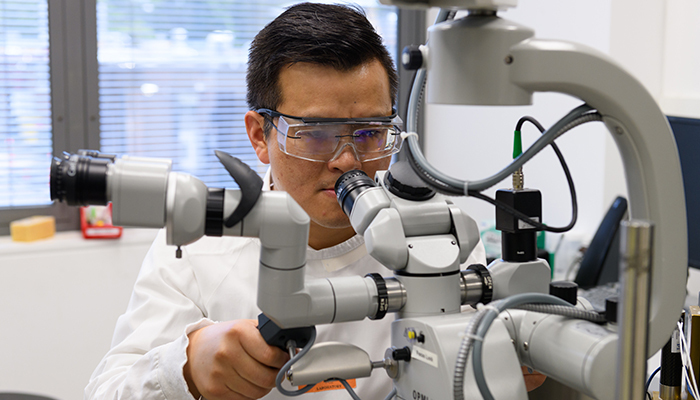 Dr Shi is a biochemical engineer who leads Macquarie’s Brain Drug Delivery research group, which is focused on three major research streams: a brain-blood barrier penetration mechanism, brain drug delivery system development and delivery system-based brain diseases preclinical evaluation. Dr Ann Zou and Dr Shi have published this research in the Journal of Advanced Materials. Neurobiologist Prof Ralph Martins is conducting a world-first trial exploring whether testosterone and fish oil may prove to be the key in preventing Alzheimer's disease. Macquarie University Hospital is the Sydney hub for a multi-site trial looking at the effects of testosterone supplements on reducing the risk of Alzheimer’s. Australian cook and gourmet food producer Maggie Beer has teamed up with Macquarie Alzheimer’s expert Professor Ralph Martins on a cook book to boost brain health.